The increase of fiber optic cables in the local loop increases the demand for devices supporting the distribution of 2 Mbps lines over the last mile. Management is an integral issue due to the number of local loops. The FME fiber optic multiplexer is the solution to convert electrical data of up to 6 channels to fiber optic signals. The modular interface concept supports any existing and all future interfaces (e.g. 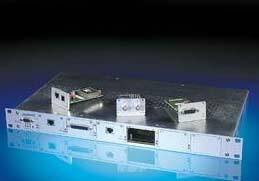 G.703 (E1/T1), X.21, V.35, 10BaseT, BRI (ISDN S0) and HDSL) to provide flexible assembly according to the user’s demands. The individual configuration of each channel (data rate up to 2 Mbps), loops and clock sources (internal or external) offers extreme flexibility and independence from central network clock sources. The 6 channel unit is available in non-fractional (FME-M) or in fractional versions (FME-F) supporting data rates of n x 56 / 64 Kbps. The distance between two FME multiplexers can be up to 5 km for multimode fiber and up to 90 km for singlemode fiber. Integral management allows the control and monitoring of each individual port via a VT100 terminal connected to a V.24 port. All management features are also supported via an external SNMP proxy agent controlling up to 4 stacks with up to 15 FME multiplexers per stack. A redundant FO link or power supply provides added reliability or link availability. Each link has its own relay contact in order to report link failures. The FME-M is available as 19" rack mountable standalone units. In data transmission as in all other types of traffic, the goal is to make use of existing 1.5/2Mbps bearer services and infrastructures as efficiently as possible. A frequent requirement is the provision of interface and data rate conversion on multiple sub-2Mbps channels in order to make the best use of paid for bandwidth. Fiber optic multiplexers are the perfect solution for carriers. An outstanding characteristic of fiber optic technology is its vast line and transmission capacity. In most point-to-point applications with simple fiber optic modems, only a single signal is sent through the fiber. The capacity is there, but a modem just does not use it. Multiplexers bundle several signals before transmitting them through the fiber, thus increasing the level of utilization. The FME fiber optic multiplexer can transmit several 1.5/2 Mbps ports through a fiber optic cable. The FME-S has 4 E1/T1 ports. The FME-M is a modular unit and its 6 E1/T1 ports can be used in combination with a large range of interface modules on the user side. That combination allows it to be used in many different situations and configurations. The 16 channel multiplexer EMUX was designed for even larger networks. Its line side modularity allows it to be used with both E3 copper interfaces and in point-to-point fiber optic applications.